The ACT Government is committed to ensuring that as Canberra continues to grow, we maintain a diverse population and physical environment, and a variety of services and economic activity. This includes building our economy and sectors where we have competitive advantage-tertiary education, renewable energy, professional services, technology, health care and social assistance-while attracting new and innovative people and sectors. Land-use planning can support high levels of productivity, liveability and sustainability. The ACT's economy is consistently ranked amongst Australia's strongest. Our economy continues to grow, with a Gross State Product growth of 4.6% in 2016-178, the fastest of all states and territories. Our strong cultural and linguistic diversity brings varied skills, cultures, languages, and experiences to our city, building its distinct character and identity. This diversity is a great asset that contributes to growing new and different social and economic opportunities, and the liveability of the ACT. The ACT is Australia's most 'human-based' economy. With a very small natural resource, agriculture and manufacturing base, we are, in effect, a 'city-state' with a knowledge- and serviced-based economy. As such, we must foster and support a city with high levels of productivity, liveability and sustainability in order to attract and retain our most important resource-people. The 2012 strategy emphasised the need to diversify Canberra's economy, focusing on supporting transport networks, communication systems and urban settlement patterns that enable broader economic investment. While substantial gains have been made since 2012, there are significant opportunities for Canberra and the region to further expand the knowledge economy, further diversify our employment base, and encourage innovation. For example there is a small but growing advanced technology manufacturing sector emerging in the Canberra region, requiring adequate supply of land to meet its growth. In addition, growth in the tertiary education and research sector is important to further diversify the ACT economy. Land-use planning can do much to support the growth and diversification of the economy and society. The planning system has an integral role in enabling private sector decisions which influence economic and social outcomes that can support our growing city, such as allowing residential development in centres to support local businesses. Respect Canberra's culturally rich and diverse community to foster inclusion and participation in our community. Our population, in total number and age composition, is not static. To plan ahead for changes, we need to understand the population trends and their implications. The ACT is becoming increasingly diverse. In 2016, 104,782 residents were born outside of Australia, representing 28% of the population. The population is increasingly age diverse, as described in earlier sections of this Strategy. This diversity will affect the way we plan for housing, infrastructure and services and how we seek the engagement of all groups in strategic planning so that diverse views and knowledge shape our city. The age composition of our districts and suburbs is shifting and lifestyles are changing. As we consider how to plan and design the urban environment to support a range of living and working opportunities, we will also consider the type and location of community services to be provided.In planning our city to meet the needs of a diverse community, we will consider our economic sustainability and changing environment. Canberra must be a city that attracts people of all ages and abilities to join the workforce, a city that promotes physical activity and provides all Canberrans with an urban environment that is liveable and helps mitigate the effects of extreme weather events. inform future planning processes and policy decisions. place-making approaches tailored to increase participation and capitalise on community strengths. Enhance the diversity and resilience of our centres to meet the needs of the community, support economic viability and improved liveability. The original role of our centres has changed and needs to be reviewed to reflect new commercial trends and to support their long-term viability and diversity.In addition, new centres of activity are emerging across the city such as mixed use areas within residential precincts, larger footprint businesses (e.g. Costco, Kaufland) and the Canberra Airport. The ACT Commercial Centres and Industrial Areas Floorspace Inventory (July 2018) indicated that between 2011 and 2018 a greater proportional increase in commercial centres' floor space was taken up by services (e.g. banks, cafes, health and professional services) over retail activities (e.g. supermarkets, bakeries, clothing stores, household appliances stores and newsagents). Figure 3 indicates the floor space breakdown from the survey. This trend is likely to continue as community expectations and shopping habits move to using centres as meeting places. Commercial land within our centres provides employment, which in turn supports increased housing provision and better utilisation of public transport connections. However, office building stock is ageing, reducing the number of A-grade office spaces within our centres. Planning mechanisms will support investment in the development and redevelopment of high quality office space within our centres to attract and maintain business. The long-term viability of our centres will depend on their ability to respond to future industry provision, community demand and expectations. This Strategy will facilitate that response. Building on the Master Plan Program, which began in 2010, this Strategy sets out how we can build on the individual character and strengths of districts and better support the linkages between centres and the districts they support. Increasing the potential for residential development in and around centres, upgrading infrastructure and undertaking initiatives to improve the vibrancy of centres will be important policy considerations.Consultation on the Strategy confirmed the importance of centres to community and industry stakeholders. In particular, people noted the opportunities that centres provide to support urban intensification to create thriving and successful places. Improve the character of our city centre to improve liveability and activity. The city centre is the heart of our city, providing employment, specialty services and a wide range of lifestyle choices. The city centre has the highest level of employment of any other location in Canberra, with almost 16% of total ACT employment. Significant growth in the number of people living in the city from 722 people in 2006 to 4708 people in 2017, represents an increase of 552%9. This growth delivers a range of benefits such as reduced commuting and transport costs, low journey-to work times, increased opportunity to easily access a range of retail, social and cultural opportunities and a range of other benefits. The city centre must remain competitive as a desirable place to live. This can be achieved with business investment, entertainment and cultural activities that create an exciting place-experience that showcases the city's distinct urban culture, artistic excellence and innovative business community. exemplary, accountable and transparent governance and compliance. Creating new opportunities and infrastructure, particularly in major renewal precincts, can help support our city centre to grow and create great places for people. Consideration of green spaces and equitable public access to these spaces is also important. The 2014 City Plan sets a vision for future development in the city centre. Extensive community consultation during the development of the plan highlighted the community's desire for the city centre to have a stronger identity and vitality that draws people to it at all times of the day and night; in effect, to make the city centre the focus of civic, cultural and recreational life of the wider Canberra region. The City Plan and related policies and plans will help determine development and growth in the above precincts and guide efficient and effective delivery of projects and infrastructure. They will unlock the potential of the city centre and better integrate it with public transport, residential buildings, surrounding parklands and educational institutions. Local, national and international interest in the city will be stimulated, attracting business and visitors and boosting the economy and liveability of the city. Renewal of the city centre and its approach along Northbourne Avenue will also be guided by the City and Gateway Urban Design Framework (the Framework) jointly prepared by the National Capital Authority and ACT Government. The Framework sets the principles for development and growth in the city centre and along the gateway corridor of Northbourne Avenue and the Federal Highway. It will ensure a unified landscape and built form that responds to vision, place, community, character and function. The Framework sets the policy context for the city and gateway corridor to ensure broader urban renewal and community benefits are achieved, including new business and lifestyle opportunities. It integrates existing government initiatives with long-term growth management and city shaping strategies and capitalises on the investment in Light Rail Stage 1.
encouraging the renewal of the city centre through projects that take a holistic design response and contribute to the context and character of the city centre, including the design of public places, streets, living infrastructure, public art and urban infrastructure. 2.3.2 Support the implementation of the City Renewal Authority's initiatives to enhance and revitalise the city. 2.3.3 Support and plan for the growth of commercial and residential development within the city centre to meet a diverse range of business investment and lifestyle choices that effectively use existing infrastructure. Recognise and protect existing industrial areas and service trades areas as important elements of a diverse economy. Land uses that provide employment play a vital role in providing a diverse range of business investment opportunities and services that support a growing community and economy. Key employment locations throughout Canberra provide opportunities for both Canberra and the region. The 2012 strategy included an action to strengthen Hume as an industrial employment location in the ACT and region. Land release and infrastructure investment in the Hume West Industrial Estate since 2012 has supported this action. Hume is strategically important because it forms part of the Eastern Broadacre employment corridor and has direct access to the national freight network. It serves both a local and regional catchment and, in recent years, has evolved into a key location for sustainable and innovative waste conversion and recycling businesses. As development occurs within the ACT and adjoining areas of NSW, the role of the industrial precincts of Fyshwick, Mitchell and Hume must be protected. These precincts are well located, connecting to the national freight routes as seen in Map 9. While many permissible uses within our industrial precincts, such as light industry and warehousing, are unlikely to have amenity impacts, some uses may affect sensitive surrounding uses through air, noise, vibration, hours of operation or other impacts. The General Industrial Zone is the only location where these uses can occur in the ACT. We must continue to provide for these uses within the ACT economy. Industrial and service trades areas adjoining town centres (Map 9) are also under pressure due to interest in the conversion of land to other uses such as bulky goods retail and residential, and due to conflicts that can arise between service trades and nearby sensitive uses. Service trade areas are important elements of a diverse economy; they often include land uses that support other commercial businesses and offer services at a range of scales to the community. Maintaining access to the services and facilities provided by these areas is important for the Canberra community. Map 9: Employment locations and key frieght routes. Click to view larger version. Plan for adequate employment land in the right location that supports a diverse range of uses including commercial and industrial land linked to supportive infrastructure, transport options and investment opportunities. To continue to meet Canberra's growing job market and support investment, we must continue to supply commercial and industrial land in locations that support key growth industries and economic diversity. The nature of employment is changing. Although employment in public service and administration remains significant, Canberra's economy continues to diversify, with new sectors emerging and knowledge industries clustering in specific locations across the city. To support expected population growth, the city centre and centres will continue to provide for employment growth, but employment clusters will also provide job opportunities, particularly for knowledge-based jobs. By understanding the scale of employment growth and land-use requirements across the city, we can ensure business locations are investment-ready and have capacity to grow. Investment in infrastructure projects will support job creation, particularly in new locations. Along with the supply of land for employment purposes, we need to understand growth industries and where and how they choose to locate in a city. The global economy is focussing on knowledge industries (an industry or activity based mainly on information and knowledge that are driven by innovation, technology and talent). Canberra is well placed to take advantage of this trend, having the most highly educated workforce in Australia. In the ACT, knowledge-based industries are clustering together to benefit from a spillover of ideas between businesses and other benefits of co-location. Examples include defence and security, education and research, professional and technology services and health technologies. Increasingly, an international trend is for businesses to locate in mixed-use precincts, rather than stand-alone business parks. Planning can support existing and new clusters to reach critical mass by investing in appropriate infrastructure, supplying adequate land for initial establishment and expansion, and co-locating clusters with compatible land uses. In addition, there is an important ongoing role for planning to support established policy under the National Capital Plan to encourage public sector employment to locate in the City Centre and Town Centres. Several employment areas have emerged in locations outside the city and town centres, the traditional primary locations for employment; for example, Lonsdale Street, Braddon; the Equinox Business Park in Deakin and Canberra Airport. Undertaking analysis to understand the structural elements and factors affecting employment location informs appropriate planning and infrastructure decisions, particularly around the integration of land use and transport. Key areas of focus for this analysis are the role of the airport as an employment node, the continued relevance of existing and proposed corridors (e.g. the East-West and North-South corridors under the National Capital Plan), out-of-centre employment locations, and existing, emerging and potential clusters. The continued supply of industrial land in strategic locations is necessary to support key growth industries, new investment and economic diversity. The east of the city, including parts of the Majura Valley and Jerrabomberra Valley and around Fyshwick and the airport, has been identified for the growth of employment-generating land uses such as industrial and related uses. This area, known as Eastern Broadacre, is unsuitable for housing because of aircraft noise and the presence of critically endangered flora and fauna. However, it is ideally suited to less sensitive uses such as light industrial and warehousing distribution stations and freight support facilities given its proximity to national freight routes, the airport and existing industrial areas at Fyshwick, Symonston and Hume. Eastern Broadacre is subject to an environmental assessment under the Australian Government's Environment Protection and Biodiversity Conservation Act 1999 to assess the potential impacts on environmental values of development in parts of the area. Detailed investigations and amendments to the Territory Plan to rezone the land for employment and related uses will follow consultation, reporting and approval of the strategic assessment. 2.5.2 Continue investigations into the establishment of new employment areas and other land uses including the Eastern Broadacre area and other potential areas. Protect and enhance infrastructure that supports the economic development of Canberra and the region. Significant new infrastructure investment, such as high speed rail, Canberra Airport internationalisation and improvements to the freight network can be key enablers of economic development in the city and region. The ACT Government remains committed to protecting the land needed for future high-speed rail initiatives. The ACT Government will work with the Australian Government and other stakeholders to incorporate high speed rail considerations in planning activities, particularly the planning for Eastern Broadacre. Canberra Airport is an important infrastructure asset for the Canberra Region, as well as a hub for business and economic growth. Although outside the established centres hierarchy of the ACT, the airport's expanding and multi-faceted role will be a key consideration in a review of employment locations in the ACT. As an important employment location, the airport provides office space and a wide range of commercial and retail facilities. Every day, more than 30,000 people travel to and from the airport to travel, greet, work, do business or shop10. The 2015 Canberra Airport Master Plan indicated that the airport provided employment for 11,000 people in more than 280 businesses in 2014, forecast to increase up to 18,000 jobs by 2019 and up to 34,000 jobs by 2033-3411. The introduction of daily international flights to Doha, Singapore and beyond means Canberra has become a globally-connected city. The flights have the potential to significantly stimulate the economies of the Canberra Region, providing opportunities for current and prospective new exporters in the city and region and enhancing tourism opportunities. Unlike many Australian airports, Canberra Airport is curfew-free, providing significant capacity to facilitate growth in both international and domestic freight and passenger movements. The Canberra Airport Master Plan 2014-2034 foreshadows the airport being a key hub for national air, rail and road transport, and a major contributor to economic growth in the city and region. It envisages significant growth in passenger numbers from 2.8 million in 2013-14 to more than 9 million by 2033-34 and a significant increase in the airport's role as a freight hub. The airport's capacity to operate effectively is reliant on the effective management of the land surrounding it. Buildings, structures and landscaping that intrude into flight paths can limit or prevent use of an airport. Residential development under flight paths can lead to complaints about noise and, eventually, pressure for operational restrictions or curfews. Industrial development that generates smoke or plumes, or other activities such as agriculture, wetland developments or municipal waste depots may attract wildlife that present hazards to aviation. The National Airports Safeguarding Framework (NASF) is a national land use planning approach being implemented in planning systems across Australia to make sure that current and future operations of airports are protected in land use planning decisions. NASF provides guidance on issues that affect aviation operations such as: aircraft noise; building-generated windshear; wildlife strike risk; wind turbines; lighting distraction; protected airspace intrusion; communication, navigation and surveillance facilities; public safety zones; and helicopter landing sites in urban areas. 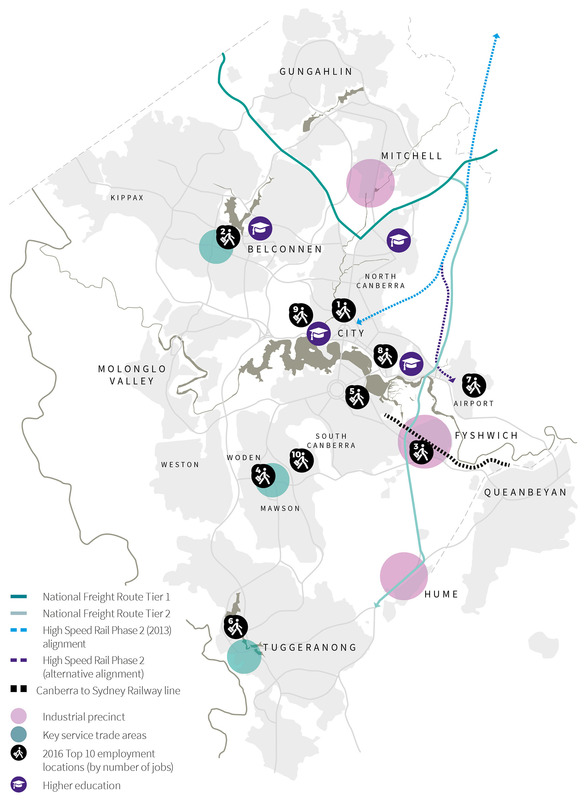 There is enormous potential for freight in the Canberra region. Canberra Airport and the national highways into and out of the ACT provide a good basis for the distribution of freight to both national and international markets. By working collaboratively, we can leverage regional opportunities to create jobs, grow and diversify the economy, and build industry capacity. Given the airport is located within the major agricultural region of southern NSW, Canberra regional producers/exporters have the opportunity to export their goods domestically and internationally out of Canberra rather than Sydney or Melbourne, which particularly benefits producers of time-sensitive fresh meats, fruit and dairy products. It is estimated that 37,107 tonnes of exports, valued at $226 million, leave the Canberra catchment each year through Sydney and Melbourne airports-equivalent to about one 747 freighter each day, or around four B-double trucks12. Using the Canberra Airport could provide a maximum potential boost to the combined gross regional product of ACT and NSW of nearly $1.2 billion over 15 years and the creation of more than 540 jobs. The ACT Government is modelling and developing corridor management plans to get a better understanding of the ACT's regional and local transport network connectivity requirements and confirm infrastructure investment priorities for the Canberra region to optimise the road network and improve productivity and safety. Investment in key transport corridors on the Monaro Highway and Barton Highway and development of cross-border infrastructure models will inform future collaboration activities between the ACT and NSW governments and the Canberra Region Joint Organisation (CRJO) to capitalise on prospective freight opportunities across the ACT/NSW region. While much of the work in stimulating a freight hub is linked to the ACT Transport Strategy, planning can ensure roads into and within the ACT are supportive of freight transport to and from the airport; for example by limiting inappropriate development (e.g. sensitive uses) and direct access points along national freight routes. 2.6.5 Support the development of the freight network by limiting inappropriate development (e.g. sensitive uses) and direct access points along national freight routes, particularly the Monaro, Federal and Barton Highways. 8. ABS Cat. 5220.0 - Australian National Accounts: State Accounts, 2016-17. | Return to content. 9. ABS Cat. 3218.8, Estimated Resident Population (ERP) 2006-2017p, ACT suburbs, districts and Canberra regions | Return to content. 10. Canberra Airport Master Plan 2014 -2034 (2015), p150. | Return to content. 11. Canberra Airport Master Plan 2014 -2034 (2015), pp 32-34. | Return to content. 12. Cadence Economics and Auxiem Management The Economic Impacts of International Air Freight in the Canberra Region (2017). | Return to content.